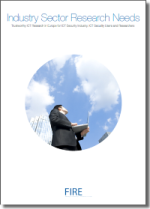 The document contains a summary of the user needs for Trustworthy ICT, expressed by users who have contributed to the project’s Industrial and Commercial Networks in the areas of: Energy, Finance, Health, Mobile Communications and Government. 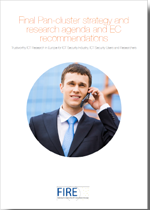 The report on Industry Sector Research Needs was authored, peer-reviewed by the European ICT Security stakeholders. The report presents a map of the social barriers to ICT adoption in the domain of security- and privacy-related solutions. The wider goal in connection to the FIRE project is: to provide a better understanding of these barriers to adoption; to inform the industry and the researchers about the possible reasons why some technologies may fail to enter the market;to enable this knowledge to be taken into account in developing and assessing various future R&D activities. The map of the social barriers to ICT adoption in the domain of security- and privacy-related solutions presented in the Report on Addressing societal concerns on legal and privacy issues in ICT-related projects was validated in three international workshops. 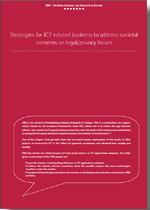 The conclusions of the workshops together with the main issues included in the report were summarized on the Report Strategies for ICT related business to address societal concerns on legal/privacy Issues.